How many times have you had the same argument with your partner? Three, five, 20? There are some disagreements that come up once, you work through and they are over, and there are others that keep rearing their ugly head time after time. Some of them are serious, and some downright ridiculous. Regardless of how long you’ve been together, everyone argues at one time or another. Some fight dirty, saying things they later regret; some rely on the silent treatment to get their point across. However it is you fight, here are a few arguments you’ve probably encountered. This one is a slippery slope. If you answer yes, you will further the argument into dangerous territory. If you answer no, you are in a roundabout way telling your partner they’re either lying or blind, neither of which they will appreciate. Regardless of who in the relationship is doing the searching, this argument can be a tricky one to talk your way out of depending on what you’ve been surfing for. Having an open conversation about what your partner has discovered is as an opportunity to explain yourself, openly and honestly. On the other hand, invading your partner’s privacy is cause for concern. There may be deeper issues here that need to be worked on. Either way, looking through your partner’s Google history is never a good idea and should be avoided. Deciding which restaurant to eat at or what movie to see seems to bring out the worst in some couples. One feels like pizza, the other feels like a steak, and finding a middle ground can be hard. Setting a plan out ahead of time can help turn the evening into an enjoyable one. One week one person is in charge, picks the food and the flick, the next the other chooses. This helps alleviate the argument and makes things fair. Day-to-day chores get mundane and tiresome over the years. 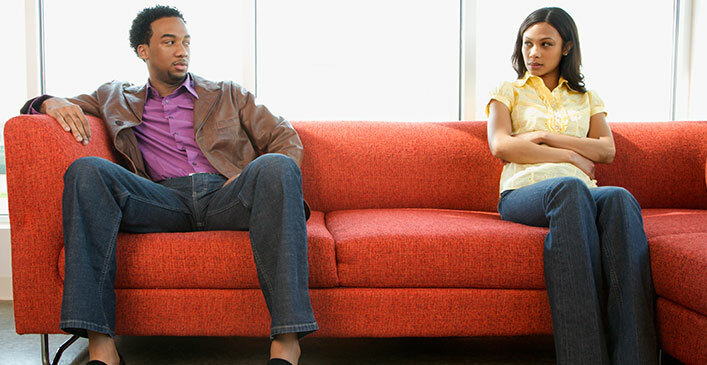 Taking out your frustration by making flippant remarks will only aggravate your partner. Over time these little comments will build up and blow up in your face. Having a few house “rules” can help set a level of expectation for both of you and should help avoid conflict. Everyone slips up, so don’t be too hard on each other if someone forgets to throw their socks in the laundry hamper once or twice — it isn’t the end of the world. Navigation can make or break a relationship. Every couple should be required to take a road trip early on in their relationship to see if it will survive. Invest in a GPS, and settle the argument for good. Money can be a big bone of contention in many relationships. When one partner spends a large sum of money on something the other deems as useless or unnecessary it is inevitable a fight will ensue. If you share a bank account, set a dollar amount together you are comfortable with the other spending on something they see fit without consulting the other. Anything over that dollar amount warrants a phone call before the purchase. If you don’t share a bank account, it’s not really your business. Cut your partner a little slack and trust they know what they’re doing with their money. All couples argue. Some say they didn’t know it was true love until they weathered their first storm together. Learning your disagreement language is a part of your foundation as a couple. If you can’t get through an argument with both people feeling good about the results, it will continue to drive a wedge between you. Try hard to fight in a clean manner and take the other’s point of view into consideration. Compromise is necessary for any healthy bantering couple.